Director Brett Gaylor explains the Do Not Track interactive web documentary at RIDM, Montreal’s documentary film festival. 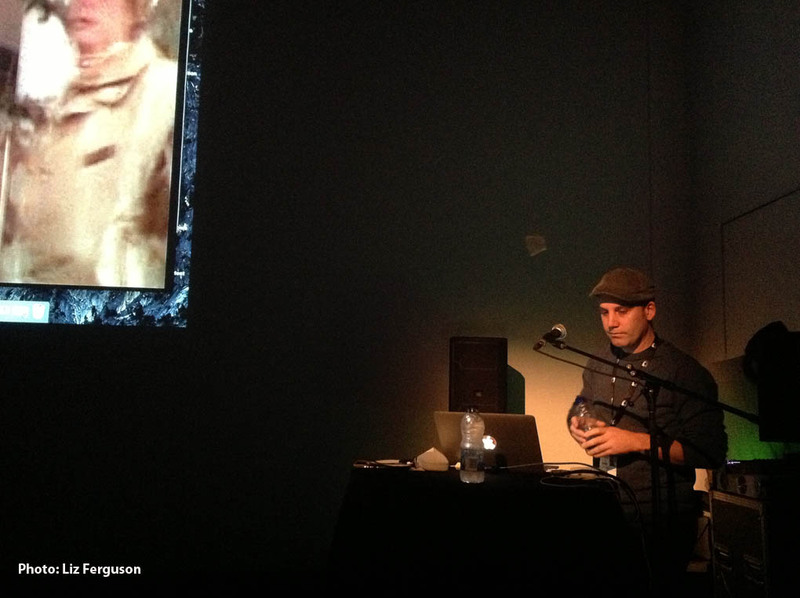 Director Brett Gaylor explains the interactive web series Do Not Track at RIDM, Montreal’s documentary film festival. Do you know about Brett Gaylor? He directed Rip! A Remix Manifesto, a documentary about fair use, the concepts of “CopyRight and CopyLeft” and DJ Girl Talk. Maybe I’ll post some links about that later. These days, Gaylor is the mastermind behind Do Not Track, an educational and international interactive web series about our privacy, or the lack thereof, on the Internet. The project is a co-production between Canada’s own National Film Board, UPIAN, ARTE, Bayerischer Rundfunk (Bavarian Public Broadcasting), with the participation of Radio-Canada, AJ+ (“the digital-only video news network and community from the Al Jazeera innovation department”), RTS (Radio Télévision Suisse). It has seven supporters, too, including Montreal’s EyeSteel Film. You can see them all here. There are seven episodes, with most being about 7 minutes long. Some could be longer, depending on the options viewers choose. The subjects are Tracking, Cookies, Social Networks, Mobile, Big Data, Future Bubble and Future of Tracking. Each episode also has some articles related to the video – what we’d call “sidebars” in the newspaper biz. “How to protect your smartphone” part of Episode 4 of Do Not Track, would probably be of interest to anyone who has one. That same episode includes links to articles in the New York Times, The Intercept, and the Electronic Frontier Foundation. (The EFF has rated so-called “secure messaging” products. You can watch these videos at home, but if you come to the director’s navigation you can hear the inside scoop on the project, ask Gaylor some questions and possibly volunteer as a guinea pig to discover your Big 5 Personality Traits, according to an algorithm that analyzes your online activity. 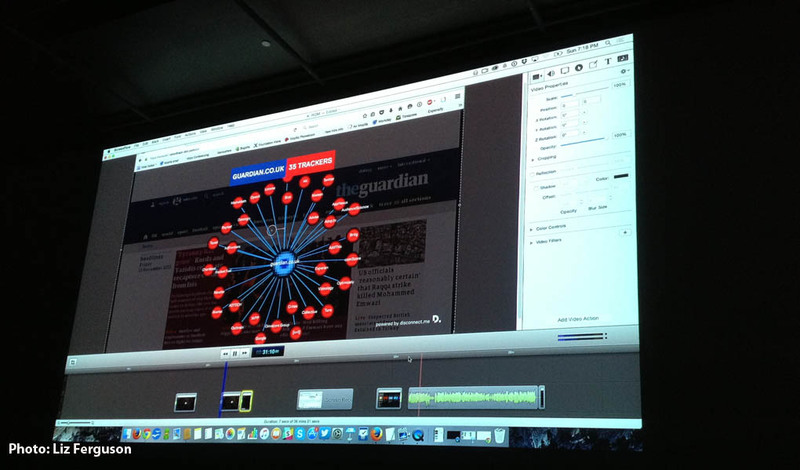 At an assisted navigation of the documentary web series, Do Not Track, director Brett Gaylor showed participants that the web site of The Guardian has 35 trackers. Gaylor remined us that the Internet isn’t really free, we pay for it with information about ourselves instead of with money. (Gaylor went on the Guardian web page and showed us that it had 35 trackers.) Trackers collect information about our needs and interests to create a profile which they then sell to the highest bidder, who then places ads on our Facebook feed and elsewhere. He said Europe has better legislation about online privacy than the U.S. does, but that technology is moving so fast that legislation can’t keep up. He raised the possibility that people would be denied loans, mortgages, or insurance coverage based on information gleaned from their online profiles and from the profiles of their friends and families. Gaylor pointed out that we do get notices about cookies, but our only option is to click “OK,” there isn’t a “NO” button for opting out. 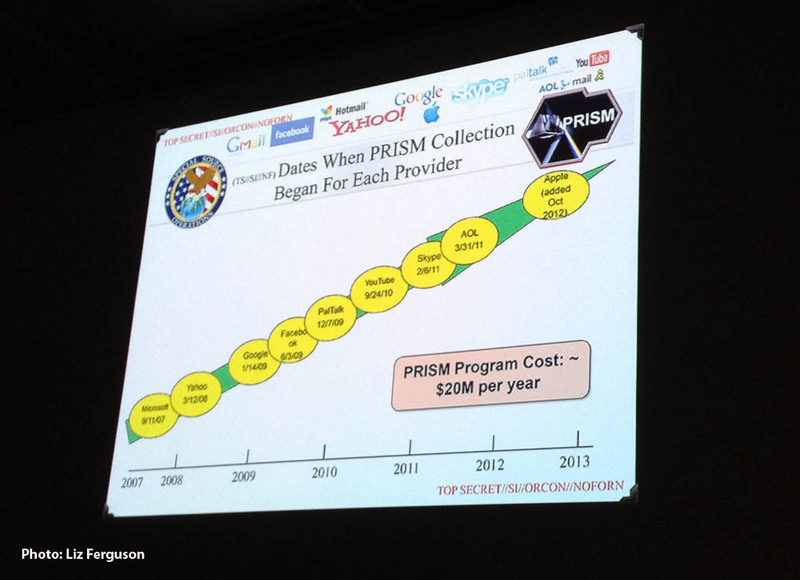 Spying on us isn’t just about selling stuff either, Gaylor presented a graphic about the NSA’s PRISM program, which has been reading email provided by Microsoft since 2007. Some people were willing to pay $10 per year for Facebook and as much as $50 for Google. Gaylor revealed that Facebook earns $9 per year on each Facebook account and Google earns $45 from selling information about each user. Tuesday, Nov. 17, 2015, 7 p.m.
335 de Maisonneuve Blvd E.
Previous Post RIDM 2015 Review: Maman? Non, merci!